Update 3: As I’ve stumbled upon some irregularities in my follow-up post, it turned out that the Twitter sample for the Sociology conference (esp. 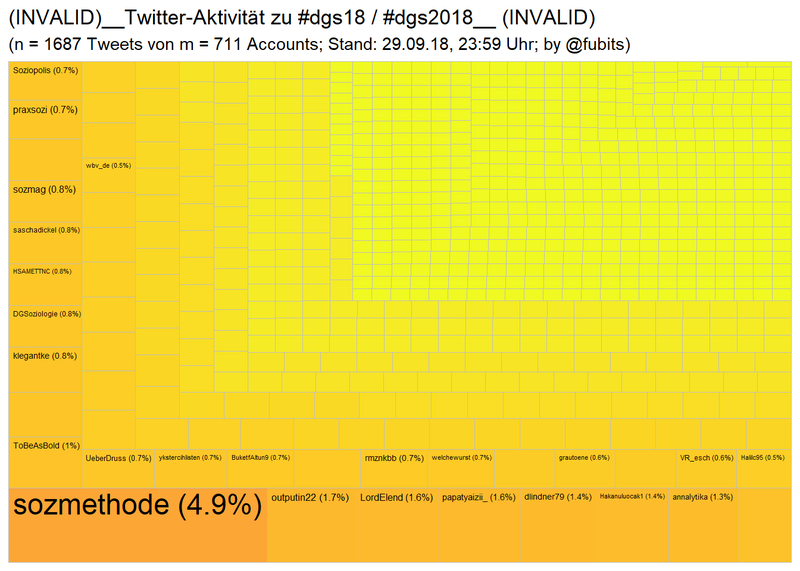 #dgs2018) was heavily cross-poluted by another popular event using the same Hashtag in Turkey… This has been adressed in the follow-up post, but has yet to be implemented here and now is also adjusted for in this post. 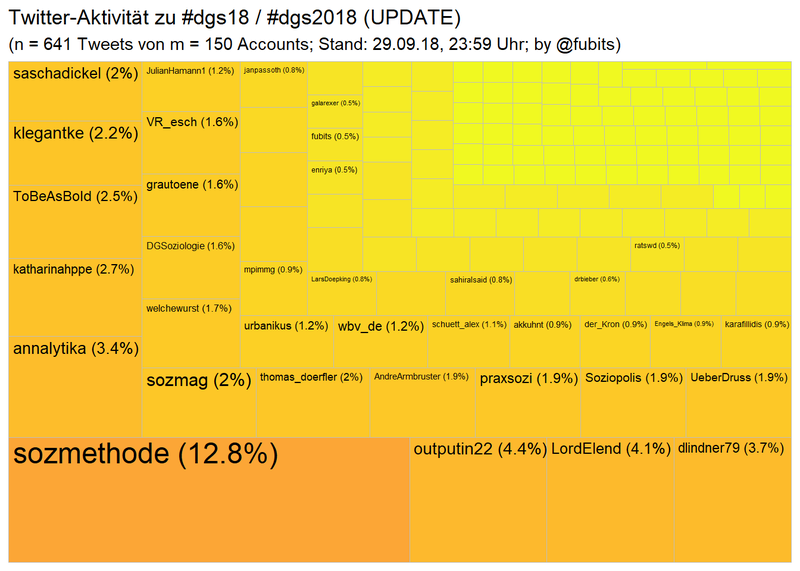 Update: Since the conferences are over but there’s still some Twitter activity, Tweets posted after 29.09.2018 have been filtered out from the samples. So let’s just get started with mining. We will use Mike Kearney’s superb rtweet (package). Follow the instructions here, set up your Twitter app and save your token. Register your App with R.
And save your token in your environment / home path / working directory. We probably won’t get all the tweets with a single request, so what we are going to do is, to request the Tweets multiple times, consolidate the requests, and finally extract unique Tweets with dplyr::distinct() to get a pretty good sample. We’ll need the treemapify package for this. For the scatterplot we’ll have to group the single Tweets by user ($screen_name), summarise the counts for Tweets, RTs, and Favs, and assign a “discipline” category for later use. 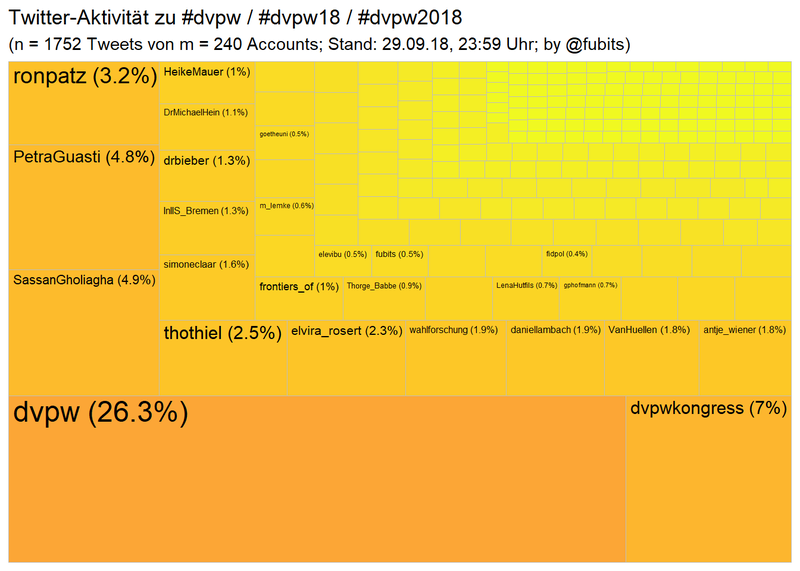 To be precise, the collective action of @dvpw has produced n = 460 individual Tweets! Here we’ll need ggrepel for non-overlapping labelling. As the official @dvpw account has been quite an “outlier”, let’s have an undisturbed look at the rest of the field without @dvpw. tba, but we could automate creating of user lists from hashtags for conferences… This might be useful for live-curating Twitter handles for better credits to speakers. 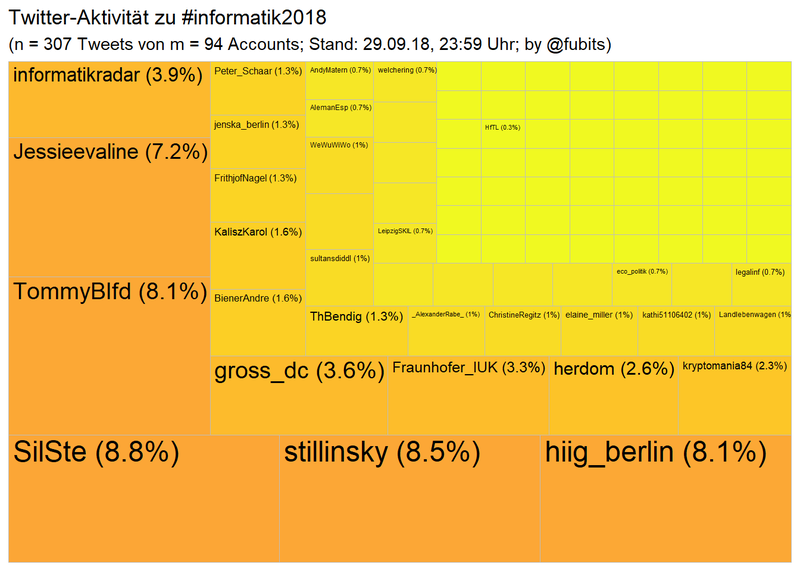 Let’s have a look at how German Sociologists performed on Twitter. Like above, I’ve mined the Tweets multiple times in order to get a good sample. 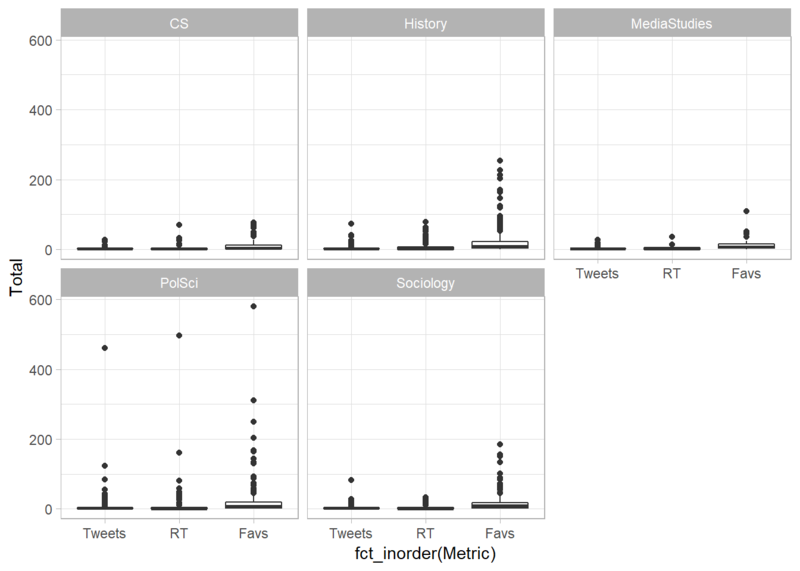 As I have discovered some irregularities while pre-processing the Tweets for a corpus analysis (see the follow-up post for details), the Sociology Twitter sample needs extra-filtering. Consequently, all the following analyses and plots have been re-done and updated. Therefore, we have to do two things: narrow down the time period to 23.9.-29.9. and filter out as many Turkish accounts as possible. For the sake of comparability, 23.9. has been set as the lower limit for the other disciplines, too. That looks rather different from the #dvpw2018 community. Less institutional dominance and actually, many more less individual Twitter users (150 active users vs 240 in team PolSci). 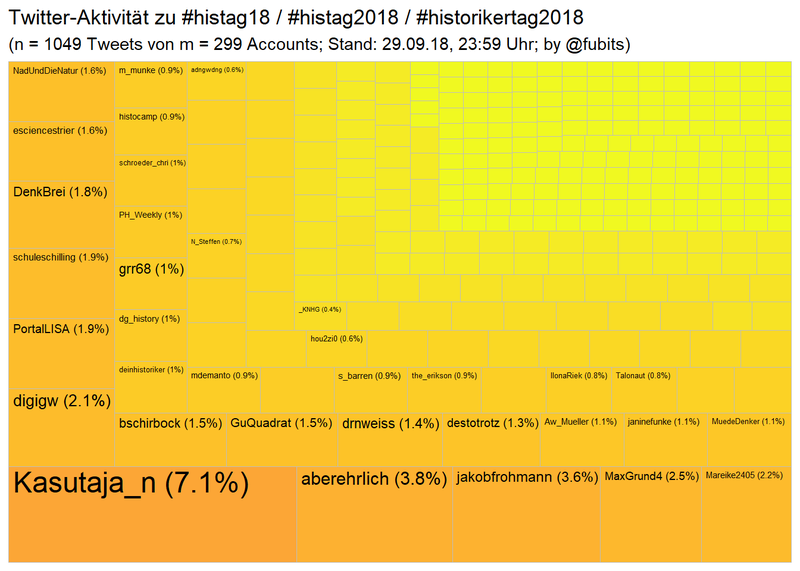 Next, let’s look have at the Twitter activity of German History scholars. 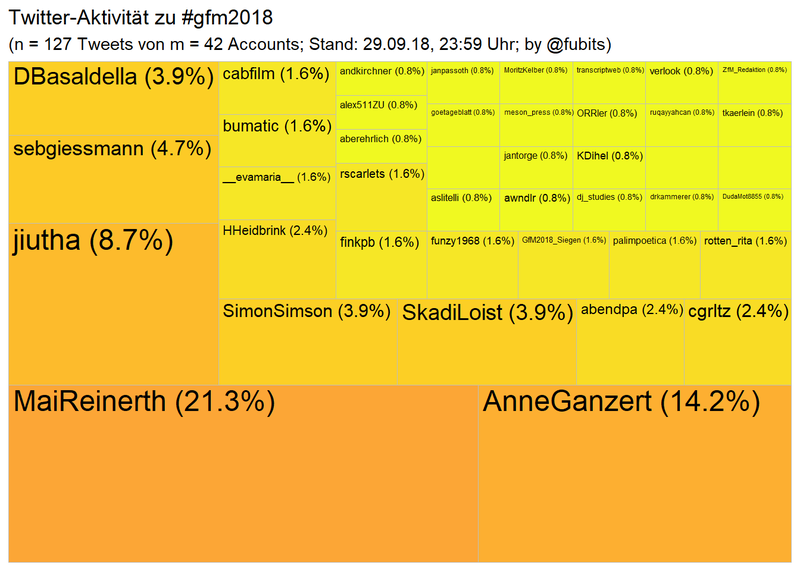 Nevertheless, let’s have a look at #gfm2018, too! Let’s treat this as preliminary. I’ve just mined the Tweets for the first time, so a couple more samples might another couple of Tweets. Don’t expect the numbers to double, though! 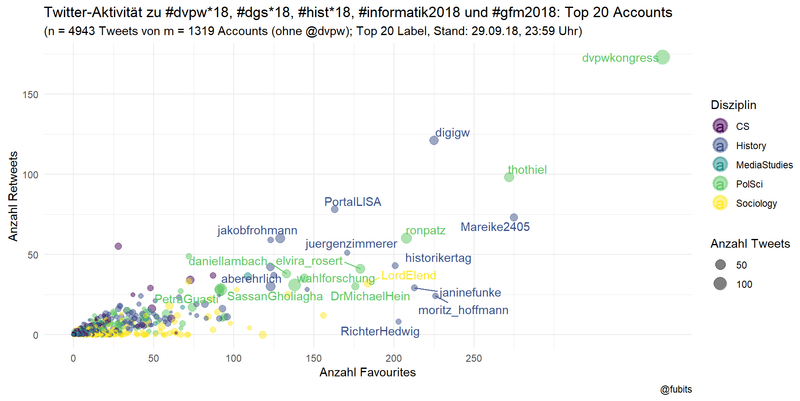 Since there’s not too much activity for #gfm2018, we can jump to the labelled scatterplot. So, this week, 751 German academic Twitter accounts have been active at four five conferences in total, producing 3815 individual Tweets. Actually, that’s quite impressive! Now we can bind the aggregated *_counts. 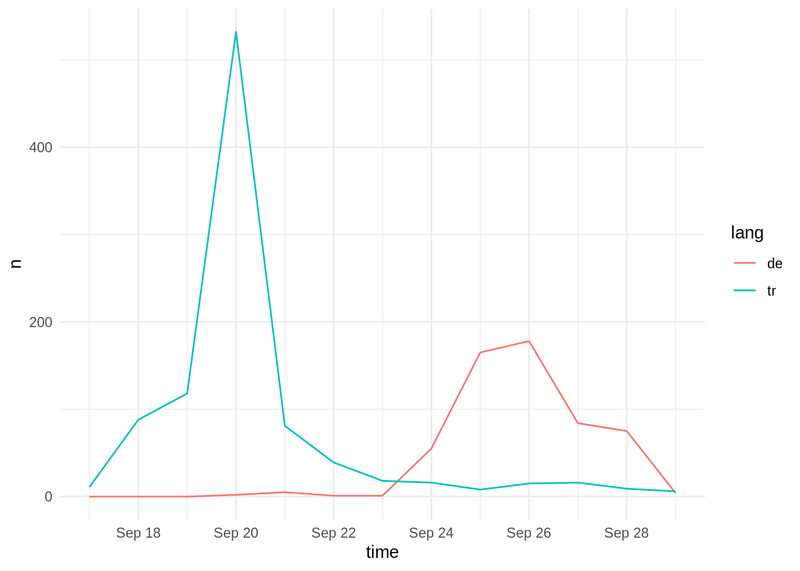 That’s what one week of academic twitter activity in Germany looks like, Duh! Hm, maybe Violin Plots can reveal more? What if we simply compare the five disciplines’ Twitter performance in terms of totals? 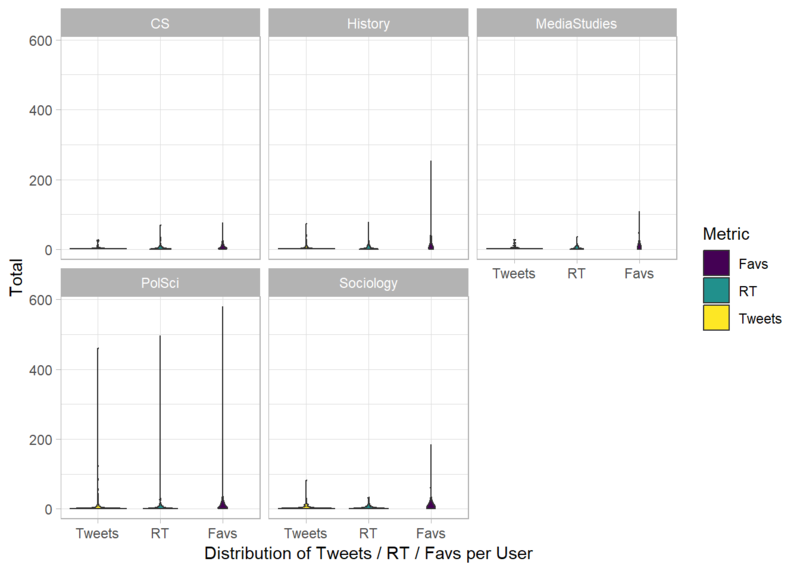 Sociology History has the highest number of active users and Favs (wow! ), while PolSci has a lead with the total number of Tweets. And what if we average out Tweets+RTs+Favs per User? Well done, Historians! If we ignore @dvpw’s Twitter takeover, you actually performed best (in terms of numbers, at least)! I guess it is fair to conclude that a well organised Twitter takeover by conference participants can have quite an effect on the visibility of a conference.